Hair dye gives you the freedom to experiment with your hair color and change your overall look for very little money. However, when you have naturally dark hair, you need to apply a lightening activator to prep your hair before using a toner and dying it a much lighter color. HairBoutique.com states that lightening products break down the melanin in dark hair, removing the color completely, so you can achieve a lighter color without it turning brassy. Mix a teaspoon each of the lightening activator and liquid lightener together in a small plastic cup. Use a toothpick to mix a teaspoon each of the developer and the hair dye in a bowl. Perform the allergy strand test by using the toothpick to place the mixture on the bend of the your elbow. Place a Band-Aid over this the area on the skin to shield it from water and sweat. Wait 48 hours to see whether you have an allergic reaction. Proceed to coloring your hair only if your skin does not show an allergic reaction to the product. If you do experience an allergic reaction, don't attempt to color your hair with the product. Place an old towel around your shoulders and secure it with a clip. Brush the hair thoroughly with a brush to remove tangles or knots. Take a comb and part hair down the middle. Remove the lid from the lightening activator bottle and the liquid lightener. Place the recommended amount of each product inside the plastic mixing bowl. Place the plastic gloves on your hands. Use the dye brush to mix the activator and the liquid lightener together. You will know when the activator and the lightener are blended together when both form a uniform base. Apply the activator to the hair by separating the hair in sections. Use the dye brush applicator to apply the mixture to the hair, making sure to cover the length of the hair shaft, including the roots. Start at the part in the middle at the top of the head. Apply activator along the part line from the front to the back of the head, then make another part about 1/2 inch from the first and apply to the root line from front to back. Continue to section hair and apply activator to the roots until you have covered all the hair on the head. Use your hands to distribute the lightener from the roots to the ends of the hair. Apply more activator where necessary to cover the entire head of hair, root to tip. Check the back of the head with a mirror to make sure you didn’t miss any spots. Use the remaining lightener to add color stripper to spots you may have missed. Leave the lightening activator on as long as the directions on the box suggests. Rinse the color activator out of the hair with cool water. Wash and rinse the hair with a shampoo and conditioning treatment designed for color-treated hair. 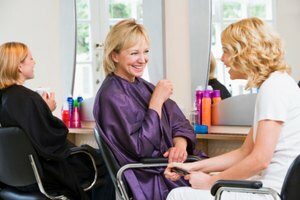 Hair Boutique.com suggests coloring thick hair in sections or separate sessions to ensure even distribution of hair dye and hair color. Wait at least a few hours to apply the hair toner and another few hours to dye your hair the color you want it to be. Do not use the lightening activator on clean hair. Use extreme caution when stripping your hair of its natural color. Often dark hair that is stripped has a tendency to turn a reddish orange color, which can be very unflattering. This is why you are advised to use a toner after you are done using the lightening activator. The toner helps to reduce brassiness. If you have any doubts about using a lightening activator, it is best to seek the services of a professional hair colorists who can help you achieve the right hair color for your skin tone. Lightening activator does not come in a box like traditional hair color. You need to purchase it along with other specialty beauty products at a beauty supply store. Hair Boutique.com; Hair Color Tips -- Understanding Laws of Haircolor; Karen Marie Shelton, et al; July 27, 2010.